This opinion piece as written by Maryiam Saifuddin, an Open Cities Fellow at the Sunlight Foundation, and Chad Marlow, an ACLU Senior Advocacy & Policy Counsel for surveillance, privacy & technology. It can also be found in our smart cities newsfeed. Urban officials dream of a future of “smart cities” that use new technologies to gather comprehensive data and algorithms to achieve increased efficiency, sustainability and safety. While many of these benefits are real, we must be vigilant to ensure that they don’t come at too high a cost, as the adoption of such technologies can also lead to an unacceptable increase in government surveillance. Many of these technologies involve cameras that can be tasked with jobs that range from keeping track of traffic to monitoring when the corner trash can gets full. The problems start when they’re also used for tracking people and their movements. In truth, they are both, and they are no longer futuristic concepts. Since the growth of “surveillance cities” is no longer a hypothetical, we should all be ready to do what it takes to create responsible safeguards, and prevent the unnecessary risks and harms this technology can create. Both elected officials and the public should be provided notice of the potential deployment of these technologies, the potential privacy and civil liberties risks they present and the real impact of their use. Whereas these surveillance technologies are often used in secret after they are acquired, only a law that mandates transparency can produce such outcomes. Moreover, cities should prioritise openness and transparency about a project before the project is implemented to limit any potential adverse effects. The Sunlight Foundation advocates for technology and data to enable government transparency and accountability through the development of mechanisms for collecting public feedback in policy and decision-making. The American Civil Liberties Union also supports robust oversight of the government, especially when it comes to surveillance and law enforcement’s use of new technology. The ACLU is particularly sensitive to the fact that these powerful surveillance tools disproportionately threaten the rights of communities of coloured and vulnerable groups like immigrants and Muslims. That’s why local government decisions about whether and how to adopt new technologies should be made with maximum public input, especially from communities that have been historically over-targeted by surveillance. Unfortunately, in many cities, these types of decisions are shrouded in secrecy, although growing trends towards transparency “by default” in cities signals reasons for hope. 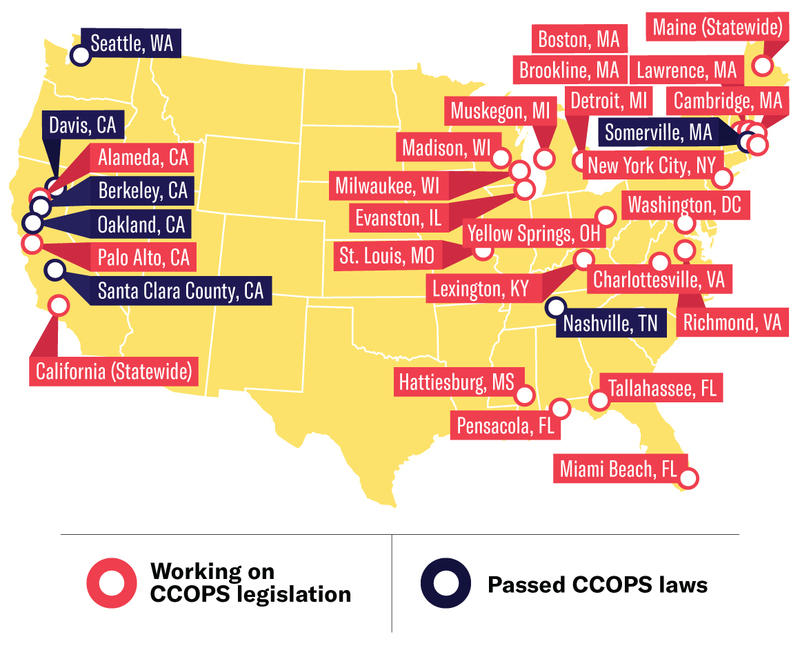 The Community Control Over Police Surveillance (CCOPS) campaign led by the ACLU has resulted in the passage of seven local CCOPS laws that require this type of needed oversight by the public and our elected officials. The CCOPS effort provides a set of guiding principles, authored by a highly diverse group of 17 advocacy organisations, as well as template model bill language for surveillance ordinances that explicitly requires transparency and public input in the procurement and deployment of surveillance technology. The model bill’s provisions include a transparent approval process that requires public disclosure, open hearings, and sign-off from elected officials on all surveillance technologies and the specific ways in which they intend to use them. Also required is a publicly released surveillance impact report that includes potential adverse effects on civil liberties and civil rights, as well as mechanisms for minimising those risks. In addition, the model requires the submission and council approval of a legally enforceable use policy that thoroughly outlines how the technology and surveillance data can and cannot be used. The use policy must provide standards to govern and limit the technology’s deployment and how collected data is analysed, stored, protected, and shared. Ongoing oversight and accountability are provided by a public annual report with non-sensitive data about how the technology has been used, information about violations of the use policy and an analysis of any negative impacts on people’s rights. The model bill also prohibits non-disclosure agreements between cities and technology companies to favour the public’s right to access information over corporate interests. These mandated processes ensure the public is aware of risks presented by the use of the proposed technology and that local officials have fully considered the benefits and costs of the project. The surveillance impact report and use policy are particularly critical to protecting residents’ interests in what would otherwise be closed-door negotiations and internal policies agreed upon between cities and their vendors. A democratic society relies upon the participation of an informed citizenry. A city cannot be truly innovative and respect the rights of its residents if only a sliver of public officials have the power to speak for — or to ignore — the broader community. Every city resident has the right to participate in decision-making processes that impact their constitutional rights. This piece was originally published on the Sunlight Foundation blog.